With all the speculation surrounding Brock Lesnar holding the WWE World Heavyweight Championship (if only they could have changed the name when they changed the logo), I am going to throw my hat into the squared circle in order to track a potential progression from the events at Summer Slam up until WrestleMania 31. We can’t discuss anything about The Beast Incarnate without mentioning The Streak. At the time it happened, and for those first minutes that followed, I was furious. I couldn’t believe that The Streak had ended and I thought the worst person in the world to have done it was Brock Lesnar. Why? The thoughts that surrounded Lesnar when he departed the company were that he never gave back to the business and in particular – The Undertaker. The two were engaged in a strong feud in the latter half of 2002 and into 2003 and Brock came up on top as he remained the WWE Champion in every bout. And then, there was the argument that someone up-and-coming should have been the one – CM Punk or John Cena spring to mind. With that in mind, I thought not only should Lesnar not beat the streak, the company wouldn’t dare to even entertain the idea. 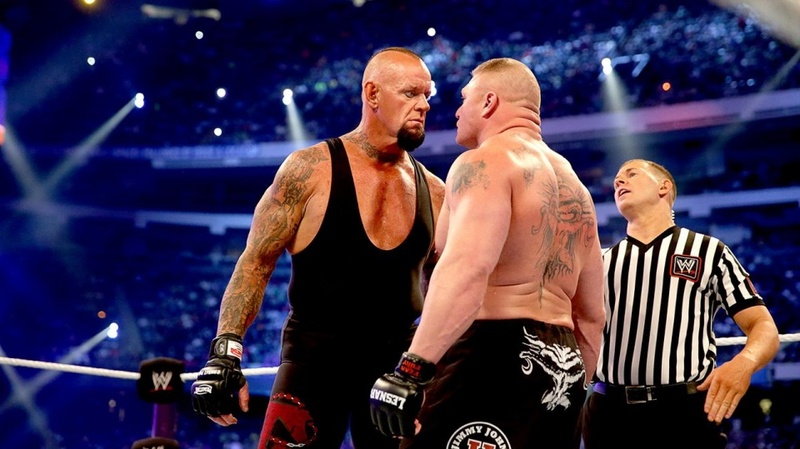 And then they both made their entrances for WrestleMania in the Super Dome: Brock came in strong – but then Undertaker had an open casket ready for Lesnar as the 22rd victim. This started the proverbial hamster wheel in my brain running – when I saw that, my eyes lighted up and I had a gut instinct that Brock was going to win, since any chance of someone looking so dominant (in this case ‘Taker so confident that he would win) usually ends up with them losing, which already made things exciting. But then I thought, this was just counteracting the fact Lesnar came on top the RAW before when he gave ‘Taker the F5. This is a staple of wrestling booking: Wrestler X gets the upper hand on the Monday Night RAW / SmackDown! show before the Pay-Per-View, but then loses at the Pay-Per-View to Wrestler Y (possibly due to interference or cheating). Example: Daniel Bryan faces Wade Barrett the SmackDown! before Summer Slam where Triple H was the guest referee. Barrett attempts to cheat, but The Game has none of it and lifts The Goat Faced Warrior’s hand in victory, cue happy ending. Then it seemed things were going the same way at Summer Slam, until of course they didn’t. So just thinking that, my mind started racing. Now, once the match started, I got bored fairly quickly as did, I imagine, most people. The crowd died, the match suffered, and so I started thinking there is no way Undertaker would ever lose his final match this way after classic bouts with Shawn Michaels, Triple H and CM Punk fresh in our memory. And then it happened. Three F5s. Silence. Shock. The Streak had been broken, no less by this ‘unprofessional’ wrestler, this mercenary, this brutish businessman who had no passion for this industry. And then it clicked – WWE got me. Storyline wise they had us all fooled, and it made for one of the most memorable moments in recent history. Not only did they get us in that respect, but they got us emotionally invested unlike almost anything before. I personally couldn’t watch the rest of ‘Mania without a sunken heart. Even Bryan’s victory couldn’t heighten my spirits, although the match was fantastic. SIDE NOTE: I just don’t understand why they didn’t keep it as a Fatal Four Way match rather than stretching two matches in one night and then have an extra slot for more of the new talent to showcase their ability, or to allow The Shield match room to breathe. This would counterbalance a lack of CM Punk to some extent and not overuse Daniel Bryan. Now, I’ve heard a lot of people talk about The End of the Streak and there are sides I agree with and sides I disagree with. With the issue dissected on Austin and Jericho’s podcasts, it definitely made me appreciate Brock Lesnar far more than ever before, to the point where I think I’ve become the biggest fan of the man (behind Paul Heyman of course). As someone wise once said, only in professional wrestling would be doubt a 36-year-old former UFC Heavyweight Champion defeating a 50-year-old man. The side I don’t understand so much is the one whose proponents uphold that wrestling shouldn’t be about making people unhappy. Of course wrestling should be about making people unhappy! How else can you be emotionally invested in something unless there is a real potential for loss – i.e. you have to see your favourites lose in a convincing fashion at some point in order to instil the idea that there is a credible threat against them and your other heroes. Sadly, that means that things will happen that we will not like – and it creates genuine disdain for the person who comes out on top over the person we would have preferred to win (Case study: Edge coming on top in his feud against Matt Hardy or Mark Henry losing to John Cena at Money in the Bank 2013 or Randy Orton cashing in on Daniel Bryan at SummerSlam 2013). In the same light, we cannot have our favourites lose constantly either, because then they no longer seem legitimate (see Zack Ryder, Ryback, what they did to Dolph Ziggler and Rob Van Dam for too long). We need those moments where our heroes win: CM Punk at Money in the Bank 2011, Daniel Bryan at SummerSlam 2013 against John Cena (initially), The Rock defeating John Cena at WrestleMania 28 and CM Punk at Royal Rumble 2013… and arguably Brock Lesnar defeating John Cena at SummerSlam 2014. Even then, the short-term picture surrounds ‘The One’ who conquered the streak. The long-term picture surrounds who will be ‘The One to beat The One Behind 21 and 1’ and therefore catapult themselves to legendary status to not only beat Brock but to also become WWE Champion. One thing that I’m steadfast against, is any comeback for The Undertaker. The way the events unfolded, even with a lacklustre match performance, was so perfect that I can’t see anyway for The Phenom to return and make anything meaningful happen (I’ll be glad to be proven wrong). If he returns and retires on any stage aside from WrestleMania, it will be a disservice to his legacy. If he returns to The Grandaddy of ‘em All, it won’t be at the same level. 21-2 just doesn’t seem to be worth anything – who would benefit from defeating The Undertaker after he has already lost once? And 22-1 just wouldn’t make a difference unless he came back to defeat Brock Lesnar and retire afterwards. The problem with that latter scenario? If he came back this year, it would be facing Lesnar for the WWE Championship, and if he won, he might just retire afterwards as champion – but it doesn’t scream box-office smash or do anything for anybody else in the most meaningful way possible (even if it sets up a new tournament for the vacant title afterwards). If he came back to face Brock in some other year, it just wouldn’t carry the same sort of significance. And facing Sting? If he wins, it does nothing for Sting, and if he loses, 22-2 just isn’t a very attractive sight or an impressive feat after the massacre we witnessed in New Orleans on April 6th 2014. Although the technicality of the match wasn’t the best, the drama surrounding Brock vs. Taker and the events that unfolded afterwards were so well played out that it wouldn’t be worth tarnishing it for anyone. Sometimes careers just fall at the drop of a hat. Finally, although Paul Heyman did a great job keeping up the memory of Brock conquering the streak over the past few months, WWE should have just sat down with Lesnar and filmed a whole week’s worth of vignettes at his farm or his house, or his gym, and then released one every PPV (about 1-2 minutes long, with his viciousness highlighted and a few segments with him cussing out everyone and anyone in his path, censored of course). Better yet, they should reach out to SportsScience and have Brock Lesnar on to record his physical and athletic skills. This way, it isn’t just a cheap return before SummerSlam, we see Brock constantly and the anticipation is built up through his vignettes. After all, we know Brock is coming for the big time events, why waste such a good opportunity by just having a lacklustre return when it can be built up far better. The same should be done with Jericho and RVD too. That’s a lost opportunity now, but it could hopefully happen in the future. That’s it for this session, but we had to lay the groundwork before we discuss what is to come next in Booking Brock Lesnar – Volume II – Cena and the Championship. Originally published with Pyro & Ballyhoo HERE on 18/09/14.